Danish high end manufacturer Densen, now launches the first of a string of new products. Densens CAST AMP is the first Densen product to allow streaming, and doing so, by using Googles Cast Audio technology. This will allow for the use of Tidal, which has become the defacto standard for premium streaming, but it will also allows for a myriad of other streaming software. The CAST AMP is the first product in Densens Dino range, which are identified by the half size compared to the usual Densen products. One of the great benefits of the Densen CAST AMP design is, that Densen has avoided creating their own software. It is well known fact, that High end manufacturers often faces problems with own software, as the computer and phone manufacturers develops new software, that is incompatible with the high end manufacturers streaming software. The digital signal from the GOOGLE CAST is converted to analogue using the build in DAC of the CAST AMP. This DAC is based on Densens experiences with DAC designs, which traces back to 1996, where Densen designed their first DAC as a OEM product for a European High End manufacturer. 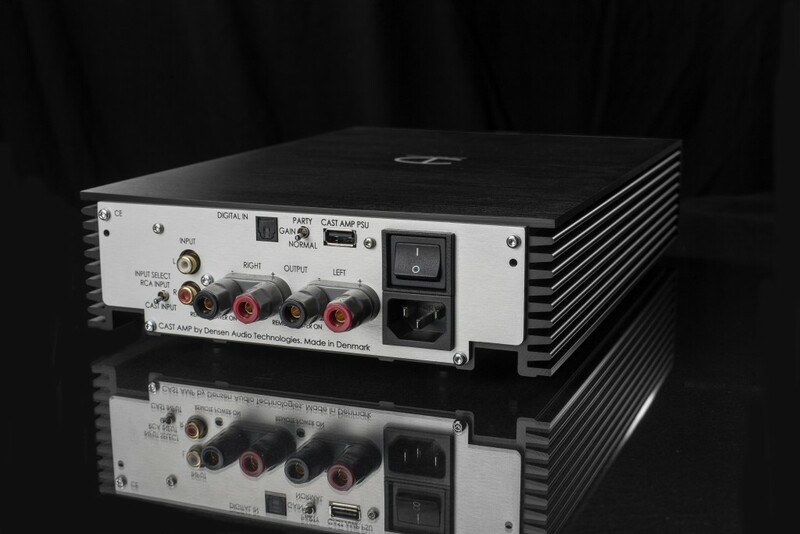 The CAST AMP DAC allows 192/24 and as such is capable of higher resolution than GOOGLES CAST delivers, this allows for future upgrades of the GOOGLE CAST technology with ease. The CAST AMP DAC has a gain selector, which secures high resolution when setting the gain from low volume up to full party mode! 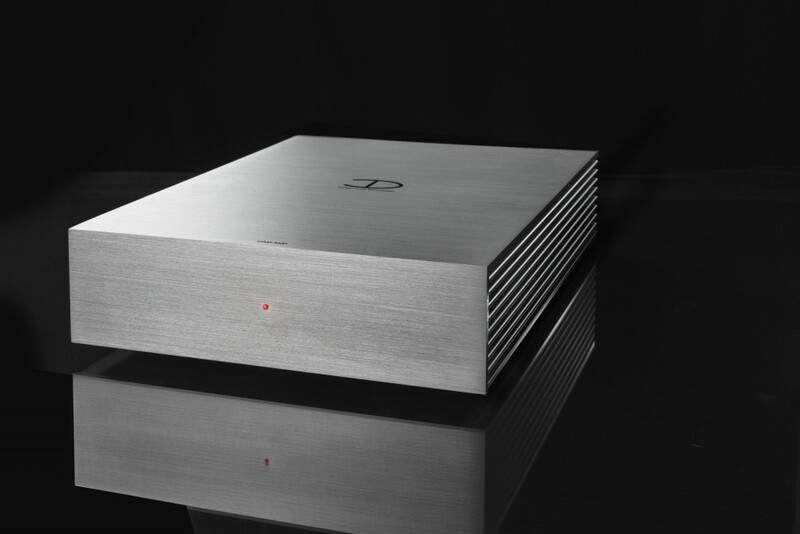 Further the CAST AMP DAC is using an DAC chip encapsulated in a shielding box, to minimize interference, and optimizing performance. It uses dedicated high performance components like Vishay metalfilm resistors and capacitors choosen for their sonical superiority, including Densens own power supply capacitors. The analogue stage is naturally a discrete design, using ultrafast transistors, and works in Class A. Naturally, this DAC can be upgraded if needed, without having to change the complete CAST AMP. The most unique part of the Densen CAST AMP is however the poweramplifier. It is based on the forthcoming Densen B- 390 poweramp. A design which Densen started the designwork on back in 2002! Over the years it has been optimized and now plays at Densen HeadHoncho Thomas Sillesens reference system, while Densen lays final hands on the production version of the B-390, which will be launched by the end of 2017, with a pricetag of Euro 40.000,-! The Densen CAST AMP uses the B-390 technology and topology in a scaled down version, and as such the Densen CAST AMP delivers 2x60W in 8 ohn and 2x120W in 4 ohm. The circuit is optimized to drive difficult loads with ease, to allow for a fluent reproduction of music in all cases. The Densen powersupplies has always contained several separate supplies, focusing on clean power to all stages of the products, and the transformers have always been custommade and most of them encapsulated in epoxy to minimise vibrations influence on the delicate audio signals on the PCB board. In the CAST AMP this has naturally also been optimized, to allowing for superior performance of each part of the circuit. In the Densen CAST AMP no less than 9 individual rectifiers is used, to secure pure power at all audio stages. The CAST AMP is the first product to use a new developed cabinet from Densen. Normally audio products are made using plastic front panels and sheet metal cabinets which has been bend in to shape and powder painted. Densen exclusively uses extruded cabinets, where all parts are made of aluminium, and extruded into shape. This allows them to much more rigid than normal cabinets, and also to be made to much tighter tolerances. At the same time, using only aluminium allows for the cabinets to be relative light, despite the impressive thickness of the cabinet, where the minimum thickness is 3 mm, and many parts even thicker! Naturally it is a huge benefit, that aluminium is non magnetic, and such, there is no magnetic distortion of the tiny audio signals. The final benefit of the aluminium cabinet, is that the whole cabinet acts as heatsink, for optimum heat dissipation, further in the extrusion is included integral heat fins on both sides of the cabinet. As such the cabinet could house a massive power amp, without violating the international standards for maximum temperature on audio cabinets. 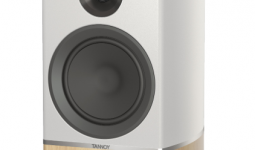 This also allows the CAST AMP to run in relative high bias, and thereby securing that most of the audioplayback taking place in Class A, while at the same time keep the benefits of headroom and dynamics as it act as a Class AB at high output levels. The result of all these achievements are a fluid musicality that must be heard to be believed. And a transparent precise and detailed soundstage and a dynamic that must be heard to be believed makes the Densen CAST AMP a neutral and precise performer of music, no matter the preferences. One will notice, that there are no display on the CAST AMP, as Densen explains, 99% of all customers will anyway relate to their Computer, Tablet or Phone for information about the playback, so it was better to save the money, and use them on even higher grade part, than normally associated with audio equipment in this segment. The CAST AMP is completely made in Denmark. The PCB are robot mounted in Denmark to tolerances less than 0,02 mm, all solderings are done in an artificial atmosphere of nitrogen to avoid oxidation of the solderings. The PCB itself is a 4 layer board, where 2 layers are used as ground layers, to further isolate the circuitry. This makes it possible to optimize the signalpath, while keeping a good insolation from various interference, due to the ground layers on the board. As usual for a Densen product, besides the standard warranty in the country where it is bought, Densen gives the first owner a lifelong warranty. This warranty comes into place, when the national warranty expires, and is done directly between Densen and the owner of the product. The CAST AMP can be used in GOOGLE HOME installations to implement multiroom solutions. Further the CAST AMP can be used solely as standalone poweramp, in which case it has a 5volt trigger, to make remote power on/off available. All these highly advanced solutions have only one goal; to ensure that the Densen CAST AMP is the ultimate in musicality with an unprecedented level of opportunity for upgrading and expanding. This is a no compromise construction. We expect that the CAST AMP will become the absolute reference, not only in its price class but for any streamer. 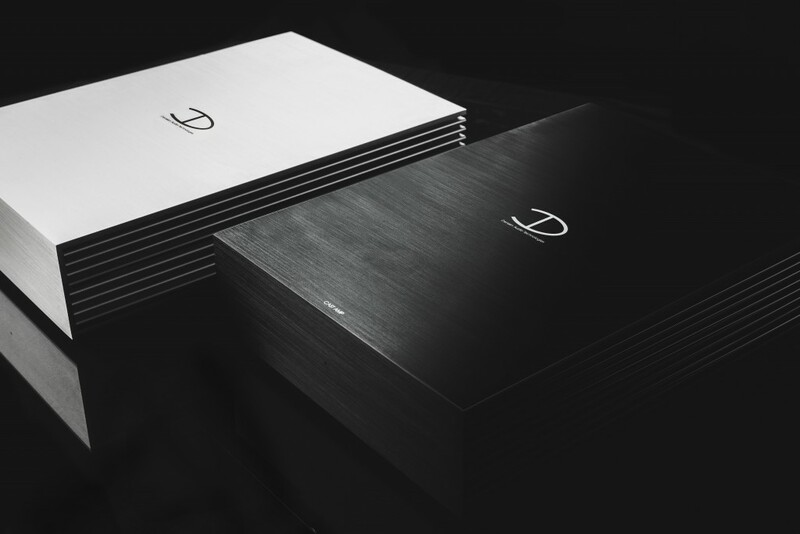 Even the packaging of the Densen CAST AMP is special, made by the internationally recognized artist René Holm. René Holm is a local artist from Esbjerg, the city of Densen. René Holm and Thomas Sillesen has both signed a book of René Holms works, from his last exhibition, and the first 100 CAST AMP even gets this book with their Densen CAST AMP. New Densen B-250CAST – Ready for ChromeCast streaming.